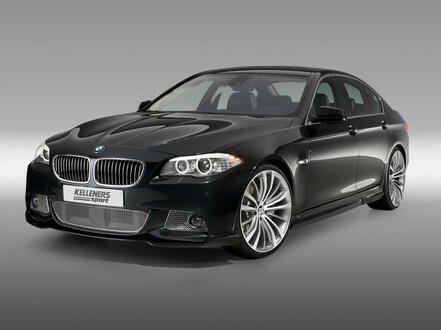 For the Geneva Motor Show Kelleners Sport has come up with a more complete version of their first package for the 2011 BMW 5 Series, this time based on the M Sport kit models. They offer power upgrade kits for the 535i and 520d models. The first gets a bump from 306 hp (225 kW) to 367 hp (270 kW) with maximum torque increasing from 400 to 480 Newton metres and the diesel from 184 hp (135kW) to 218 hp (160 kW). Kelleners also tweaks the exterior and provides an interior package as well. On the outside the car gets small details like mesh grilles, rear diffuser and trunk-lid spoiler plus 9×20 inch wheels. the interior is garnished with black leather upholstery with white stitching and polished aluminium trimming as well as a set of real velour black floor mats carrying the tuner’s logo.